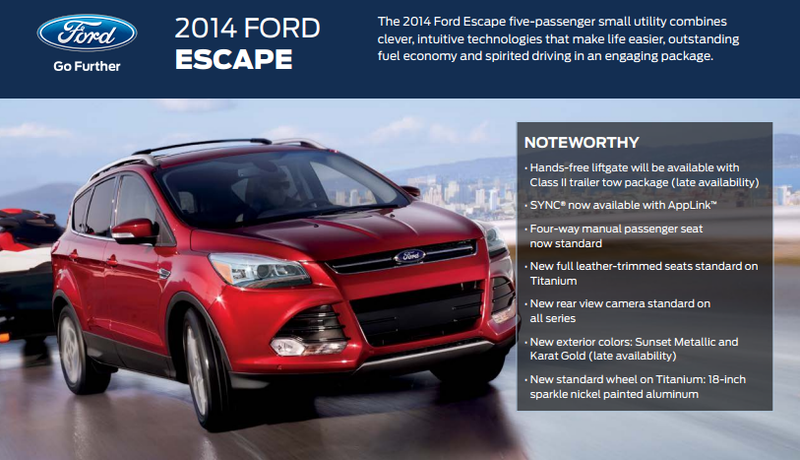 My Time With The 2014 Ford Escape! 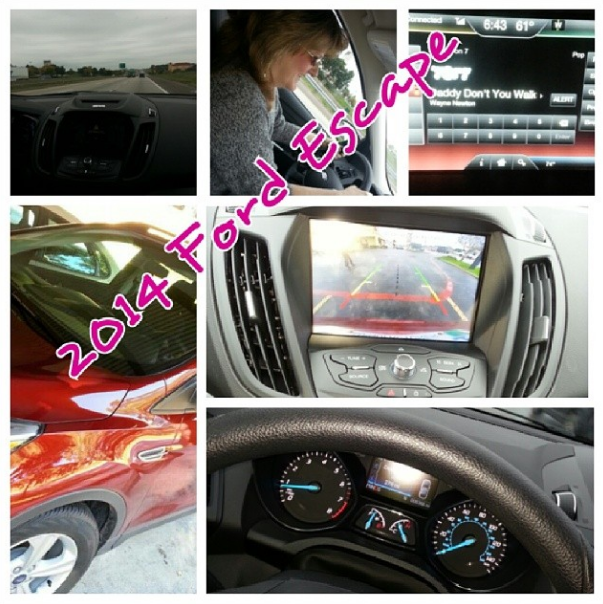 You are here: Home / Sponsored / My Time With The 2014 Ford Escape! Last week I was loaned a 2014 Ford Escape and I loved it! In the video below I give you a little walk around. One of the features I missed was the sun roof – it actually had 2! The gas mileage was awesome I drove it all week and never had to put any gas in it! I drove it to the other side of Dallas and back more than once! · Complementing these easy-to-use features is outstanding fuel economy, which is one of the key reasons customers are flocking to small utility vehicles. Each of the two EcoBoost® four-cylinder engines, a 1.6-liter and a 2.0-liter, delivers outstanding fuel economy – up to 32 mpg highway – with great performance through core EcoBoost technologies of turbocharging and direct injection. · Escape’s EcoBoost engines also add twin independent variable camshaft timing to this successful recipe. Ti-VCT offers up to a 7 percent improvement in peak power and a 5 percent improvement in low-speed torque for better acceleration, passing and merging performance, as well as up to a 4.5 percent improvement in fuel economy versus engines not equipped with the technology. These EcoBoost engines are mated to specially calibrated, six-speed SelectShift® automatic transmissions, which are standard and allow drivers who want more hands-on experiences to manually control gear selection from a switch on the left-hand side of the shifter. The specially engineered torque converter contributes improved driving feel, silky-smooth shifts and even better fuel economy. Engineers also installed revised gear ratios for a balanced driving feel in all situations. Intelligent 4WD uses advanced software and sensors to analyze data from 25 external signals, including wheel speed, accelerator pedal position and steering wheel angle, assessing road conditions and driver input 20 times faster than the blink of an eye. The system uses all the sensor inputs to turn the vehicle in the direction the driver wants it to go. Intelligent 4WD builds on the preemptive actions by adding and subtracting torque as needed through an electromagnetic clutch. This means Escape delivers outstanding handling on pristine pavement and in adverse conditions as well, along with excellent traction off-road. So, if you’re thinking of buying a new car – make sure you stop by your local Ford dealer and take this one out for a test drive!